All focus will remain on the weakness of USD and the Italian election results. 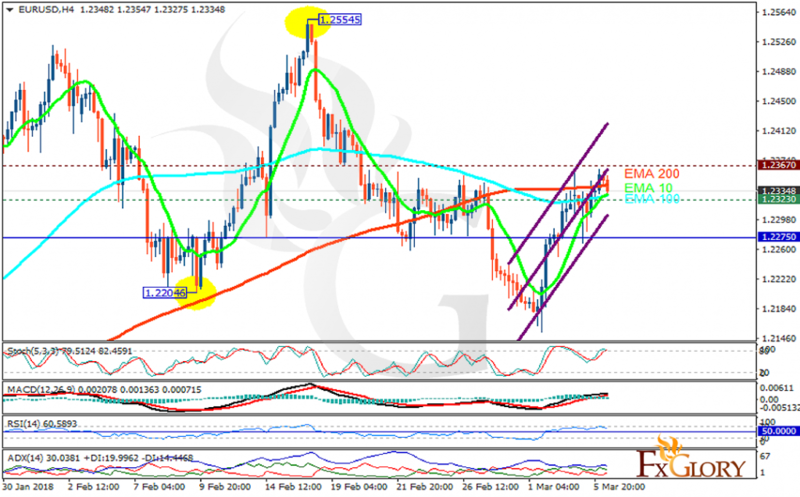 The support rests at 1.23230 with resistance at 1.23670 which both lines are above the weekly pivot point at 1.22750. The EMA of 10 is moving with bullish bias in the ascendant channel and it is below the EMA of 200 and above the EMA of 100. The RSI is falling towards the 50 level, the Stochastic is moving in high ranges and the MACD line is above the signal line in the positive territory. The ADX is not showing any clear signals. EURUSD will continue its growth within Andrews’ Pitchfork targeting 1.25 area.